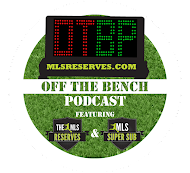 The MLS Reserves: Off The Bench Episode 55: The Transfer Episode- Who went where and did it help? Off The Bench Episode 55: The Transfer Episode- Who went where and did it help? In this episode Luke Lohr and Pedro Gomes talk about which teams have made changes to make themselves stronger and who might be left out of the playoff picture. Shalrie is a DP and the Vancouver Whitecaps are looking good. Off The Bench is coming at you! Here's your fun bit for today. Remember the first MLS All-Star game to take on foreign opposition? We do.